Whether you're powering through an online battlefield on Xbox Live or chatting with a friend over Skype, your WiFi router is the gatekeeper to your wireless connection. It takes the wired Internet connection coming from your modem and transforms it into a wireless signal. Most households have wireless routers that are a few years old. With each passing year, more connected devices join your home Wifi network, putting more stress on that outdated router. It’s important to know what to look for in a router, because like most people, you’re probably due for an upgrade. In fact, you should replace your router every two years to stay current with advances in WiFi technology. WiFi travels through your router on radio bands that act like invisible highways. Each band is a different lane, keeping data on separate routes to avoid congestion. Because certain devices demand more bandwidth than others, your router’s efficiency depends on the number of bands it has—single, dual, or tri-band. A three lane highway (or tri-band router) has one 2.4 GHz and two 5 GHz channels to support more simultaneous users—a huge plus for families, who average eight devices per household and have high bandwidth activities. How you use your WiFi also helps determine what router best suits you. For instance, a tri-band router is a great choice if you're a movie streaming buff with a number of TVs, you have a gamer in the house, or you work at home and want your own dedicated band. On the flip side, if you’re a light Internet user who primarily emails or browses Facebook, a dual-band router will work just fine. Routers lead the pack when it comes to deploying the latest WiFi standards, and their client devices (your phone or tablet, for example) typically start incorporating the new technology six to twelve months later. For this reason, it’s best to future proof your home WiFi network with the most current WiFi standard to make sure it can support the hottest products when they hit the market. In 2012, WiFi significantly improved with the emergence of the 802.11ac standard, which packed almost triple the speed of its predecessor, 802.11n. 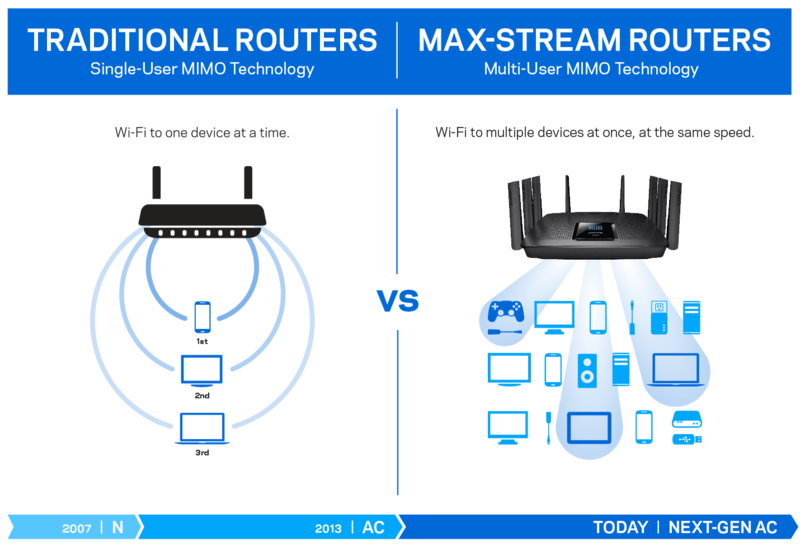 The latest standard is MU-MIMO (Next-Gen AC), which stands for multi-user multiple input and multiple output. That’s a mouthful, but what does it mean? This update to the 802.11ac standard improves the way WiFi interacts with multiple devices at once. Whereas single user (or SU-MIMO) routers serve data in a serial fashion to one device at a time, MU-MIMO routers serve data to multiple devices at once. For example, let's say you’re chatting on FaceTime while your children stream a movie on Netflix. With a SU-MIMO 802.11ac router, your devices have to wait in line while the router shoots data at them one at a time, leaving the other without signal. It may only be for a millisecond, but that moment without connection creates lag (what we know as buffering). With MU-MIMO, your router transmits data to both devices at the same time, creating a seamless experience—and happier kids. With the introduction of 802.11ac in 2012, WiFi was sped up considerably, running as fast as 1300 Mbps on the 5GHz band. In 2015, WiFi was accelerated once again with the MU-MIMO standard. These models can reach speeds up to 1.7 Gbps, or about 1700 Mbps. Consider the number of people who will be simultaneously using your wireless network when deciding what speed is best for you, as well as the type of activity that is common in your household. If you’ve got a house full of Netflix addicts and online gamers, MU-MIMO is definitely the way to go. When comparing routers, you'll see that some models have antennas protruding from the case, while others do not. Routers with internal antennas look more elegant on a bookcase or table, but those with external antennas can give you stronger signals. If you have multiple antennas, you can adjust them to better deliver coverage to each floor of your home, from the basement to the upstairs bedrooms. Some routers come equipped with mobile app compatibility, allowing you to remotely check in on your home Wifi network settings. From your smartphone or tablet, you can prioritize WiFi between devices, monitor your speeds, restrict sensitive content from the kids, or access home security cameras while you're at work. Quality of Service or QoS is a feature found in advanced routers that gives you the ability to prioritize certain kinds of WiFi traffic. With so many connected devices in your home like smart plugs, mobile smart phones and notebook computers, your WiFi signal can get stretched thin. By utilizing the QoS feature in your router, you can ensure the router will allocate the appropriate bandwidth to your favorite devices. For example, you can set the QoS option in the router's admin panel to give priority to online games or video streaming. This means that if someone downloads a file while you're playing an online game, your game won’t lag because it’s been assigned first priority. Beamforming is another advanced option on modern routers that can significantly improve signal strength and speed. Beamforming (or spatial filtering) gives the router the ability to focus the signal toward specific devices in your home instead of blanketing the entire home with the same signal strength. The router finds the location of your device to determine where to focus the WiFi signal. Beamforming increases WiFi signal speed and strength, improving your overall connected experience. Not all WiFi routers support Beamforming, so do review the specifications to ensure this feature is included. WiFi routers aren't limited to wireless connections, they also have Ethernet ports, which can connect your computer or other devices to your home network with an Ethernet cable. An Ethernet port and cable look like a common telephone cable, but with wider ports and connectors. When would you want to use the Ethernet port on your WiFi router? You can free-up your WiFi bandwidth for other truly wireless devices like your notebook computer, smart phone, or tablet, which travel from place to place with you as you move about your home. Think about those devices that are not portable as possible candidates for hardwiring to the Ethernet port. This could include your desktop PC, game console, cable TV console or a smart TV. To do that, simply plug your device directly into the router using an Ethernet port and cable. Older routers with Fast Ethernet support speeds up to 100 Mbps, but modern routers support Gigabit Ethernet, which is ten times faster at 1000 Mbps. When it comes to transferring large amounts of data, the need for speed often surpasses even Ethernet’s capabilities. Transferring a terabyte of backup files from an external drive, for example, can take more than two and a half hours at 1000 Mbps. This is where eSATA external drives come in handy. eSATA stands for External Serial Advanced Technology Attachment, which allows an eSATA external hard drive to transfer data much faster than Ethernet or WiFi. Routers that support eSATA hard drives give you the option to connect your external storage device directly to the router, making backups accessible to everyone in your home at speeds up to 6 Gbps—much faster than using USB 2.0 or Firewire. To ensure your devices are getting the most out of those WiFi signals, place your router in a central, elevated position, like a desktop or a shelf. Avoid thick concrete walls, metal objects, and HVAC equipment wherever possible, and keep the space clutter-free—large objects and other electronics inhibit the router's range. If you have a large home with a lot of square feet where devices stray far from the router, consider adding a WiFi extender  to amplify your signal across a long range. If you still aren't getting the speeds you’re looking for, your Internet package may be the culprit. There's no point investing in upgraded home WiFi networking equipment like routers and modems if your broadband speed isn't up to par.